The clean and overhaul kit contains all of the springs, gaskets, seals and other components required for routine maintenance and whenever the pump is dismantled. Add a blade kit for a full service. The major service kit contains gaskets, seals, filters, blades bearings and other components required for a complete service after prolonged operation or after pumping corrosive gases and vapors. Industrial wet pumps are used in a wide variety of applications and produce reliable vacuum for many processes. To optimize the installation and to prolong pump life, Edwards offer a range of accessories for our large oil-seated pumps. Our pumps and accessories are designed to ensure that accessories are easy to install. 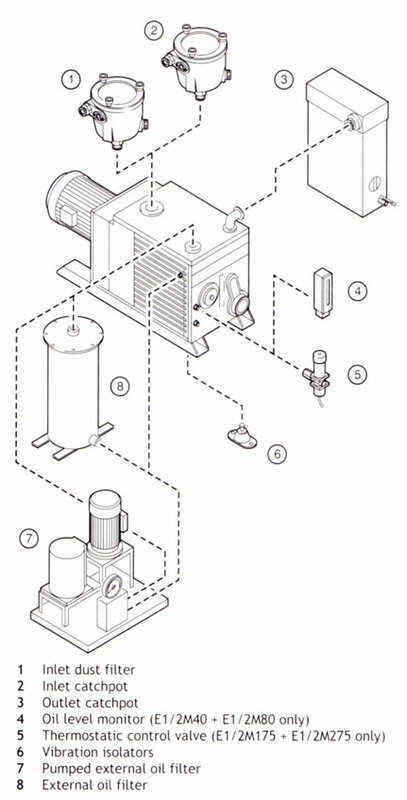 We offer inlet and exhaust traps and filters, together with external oil filtration and oil pressure monitoring, pump temperature control and vibration isolators.